Jef Murray Studios: Exploring the boundaries between worlds…. Wendy returned to her apartment above the print shop, deep in thought. She didn’t notice the two young men watching her ascend the stairs. Nor would she have noticed, even if she had bothered to look out her window, that the two panhandlers seemed to be spying upon her apartment from the street. Wendy spent the evening looking through her possessions, and she soon realized how little truly bound her to her world. Her most cherished possessions were her books, and she searched through these until she found exactly three that she thought she could not live without. The first was the Bible that her mother had left her. The second was a collection of beloved fairy tales that she had had since she was little; she had found it in an old antique store when she was very young, and it was the first book she had ever purchased. The last was an epic fantasy novel that had been given to her by the kind shopkeeper; it was his favorite book in the world, and one she thought Rowena would love. The next morning dawned chill and grey once more. Wendy went down to the print shop as usual, but when a quiet moment came, she asked if she could speak with the shopkeeper. Timothy led her back to his desk and listened to her story; Wendy could not refrain from telling him the full tale, since she was sure now that she would not be returning to the shop again. “Oh, no, I don’t think they are, but I suspect they are not as rare as you seem to believe. There has always been magic at the Village; that’s why I love it, too! But I have to say I do rather envy you the chance to go to a world filled with elves and dwarves; what fun!” Timothy beamed, and then he stood up. The trip to Shaker Village that afternoon was uneventful, although the weather remained grey and foggy and snow was expected. Timothy kept asking Wendy if the few things she had with her would be enough. She assured him they would be. He said he would offer her money if he thought it would be of any help to her, but he rather suspected that Ladydale folk, if they used money at all, would only recognize gold and silver as payment. “And I’m afraid I’m completely out of silver pennies,” he chuckled. They arrived at the Village parking lot just as the evening was settling in. Wendy left Timothy’s car, came around to the driver’s side, and gave him a kiss on the cheek. “You’ve been very good to me,” she said. Wendy waved goodbye to Timothy as he drove away, and then she turned toward the Village road. She didn’t notice the battered Chevy that had pulled into the parking lot, nor the two seedy-looking young men that emerged into the gloaming and followed her. She reached the portal and stooped down. Azarias was there, with Rowena. They seemed relieved. “I was so worried you weren’t coming!” said Rowena. “Yes, I have. And, yes, I want to come with you!” said Wendy. Rowena clapped her hands together in joy. “What must I do?” asked Wendy. .“There are two men coming,” she said to Azarias. His words seemed to fade as she released his hand. She opened her eyes. She was sitting on the grass, just as before, but the air was warmer, and the light, though fading, was not grey, but gold and blue. For a moment she thought that the wizard’s spell hadn’t worked, but then she saw Rowena sitting next to her, and in the next moment they were hugging each other tightly. “It worked! It worked!! !” Wendy said. After a few moments the girls stopped hugging and Wendy looked around her. “But where is Azarias?” she asked. Wendy looked horrified, then glanced through the portal. But all she saw was the golden light on the other side of the fence; the portal had closed. The two young women stood up and began the short walk back into town, arm in arm, laughing and bringing smiles to all they waved to in the gloaming. And Wendy noticed that the evening star was shining brightly before them, leading them home. That is the essence of the tale as it was told to me by Michael. I was curious as to how he had come to know so much of it, since it seemed to me that there were virtually no witnesses to most of the events of the last days of Wendy’s time in Harrodsburg. But Michael insisted that the tale was true. He had heard much of it from the shopkeeper, Timothy, who was a regular visitor to Shaker Village; also, he was reasonably sure that he had met Azarias, at least once. But, aside from these, there was the matter of the two cats. Shaker Village, despite having been a functioning farm in its heyday, never had had a problem with rats, and the proprietors had always declined offers from local farmers and households to provide cats in order to control their populations. But, the morning after Saint Lucy’s day just a few years before, two black cats had suddenly appeared in the Village. No one knew where they came from, and every time Village folk tried to give them away or take them to an animal shelter, they would reappear again in the Village. 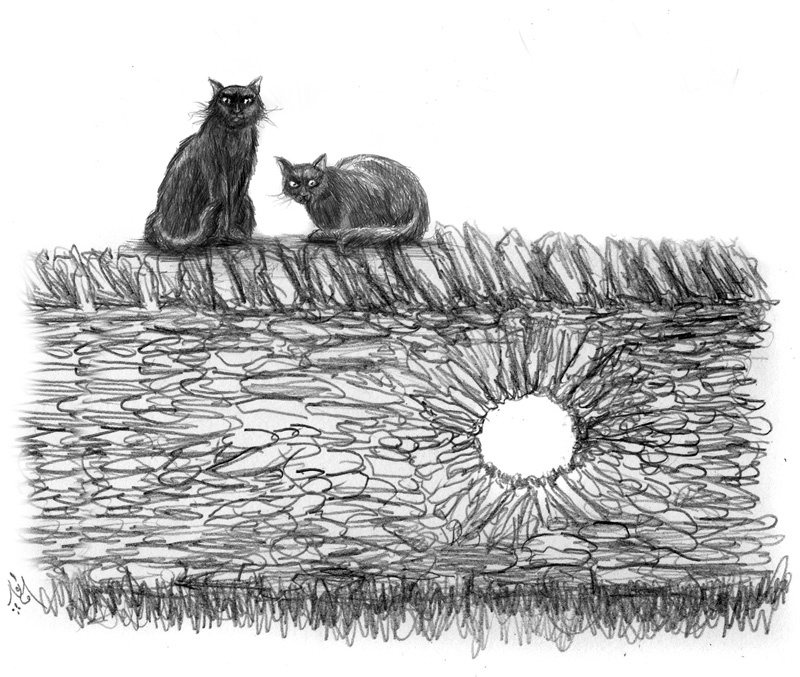 You are very likely to see them there to this day, prowling about the stoops of the Village Dwellings in the cool evenings and rolling languidly upon the sun-warmed stone steps. “Oh, yes, yes, I’d forgotten all about that,” said Timothy. “You’re quite right you know, the cats were involved. And in fact, I was there. You see, when I dropped Wendy off and started to leave, I noticed the two men getting out of their car. They made me uneasy, so I pulled back into the parking lot and followed them. Sure enough, they seemed to be trailing her along the road toward the West Family Lot. I saw them round the corner in the road, near where the portal was located, and when I was able to see them again, they were closing in on Wendy, who was sitting on the ground in front of the portal…or so I thought. “What happened next is difficult to say for sure. I saw a bright flash of light, and the person I thought was Wendy stood up, but it couldn’t have been Wendy, because the figure was far too tall. I heard a word of command spoken, and then there were two more flashes of light. The two men that had been there were gone; in their places were two black cats. The beasts were terror-stricken, and they immediately shrieked and bolted away and took shelter in the bushes beside the road. “I came closer. The figure beside the fence stepped onto the road and I could see that it was an elderly fellow with long grey hair and a beard. He had a stout walking stick that he leant against. ‘You’re the shopkeeper, aren’t you?’ the man asked. This entry was posted in Uncategorized on October 31, 2014 by admin.